Google Nexus S is real, gets leaked by Best Buy [U] | Electronista. Can you imagine Microsoft launching a Microsoft branded phone to compete with its Windows Phone licensees? When Microsoft launched the Zune, their licensing model (PlaysForSure) was quietly folded up. A Google phone makes little sense, but then again Google does not seem to care much about its ecosystem or relationships with Android device vendors. They even claim that they have no idea how many phones are being built using Android and, except for activations, have no way of measuring the number sold. From their point of view, if Motorola feels it’s unfair to have to compete with a Google branded Samsung (or HTC) designed phone then too bad. There’s lots of white label vendors lined up to make these with or without anyone’s blessing. In fact, the biggest opportunity for Android growth seems to be the large unlicensed (and illegal) grey market which seems to be rapidly expanding. Gartner released sell-through data for the handset market. In the release appears an estimate of total Android 3Q Smartphone sales (20.5 million). 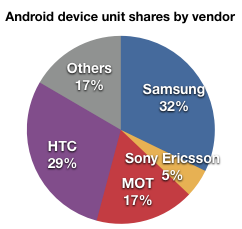 Combining this with what some of the vendors have reported in terms of units sold, we can estimate the share of Android by vendors. Note that this is a rough estimate. We don’t have data on Sony Ericsson’s smartphone units sold and we don’t know the mix of HTC’s Windows Mobile vs. Android. I’m also assuming LG as part of Others. The data from Gartner is claimed to be sell-through whereas vendors report sell-in so there is more roughness about each vendor. Regardless of these potential sources of error, it’s a very safe bet that Samsung and HTC are the largest Android vendors by a fairly large margin. Motorola is keeping its Windows Phone options open, leaving “Others” as the only likely exclusive Android vendors. What did Andy Rubin mean by saying WP7 was created for political reasons? Google has created a partial list of phones that run Google services. I notice with interest that it’s called a Google Phone Gallery not an Android Phone Gallery. What’s more, there is a distinction of All Phones and Phones “with Google”. Of course that implies that we can get a list of Google Phones “without Google” (or maybe more accurately, “with partial Google”). CE-Oh no he didn’t! : Anssi Vanjoki says using Android is like peeing in your pants for warmth — Engadget. A quick follow-up on Anssi Vanjoki’s observation on Android. When he suggested that Android would be just a short-term solution for phone providers the metaphor he used was that it was equivalent to peeing in your pants for warmth in winter. I wanted to point out that strategically, using Windows Phone is the same thing, except that vendors have to pay for the urine. Can Android change the distribution of profit among phone vendors? 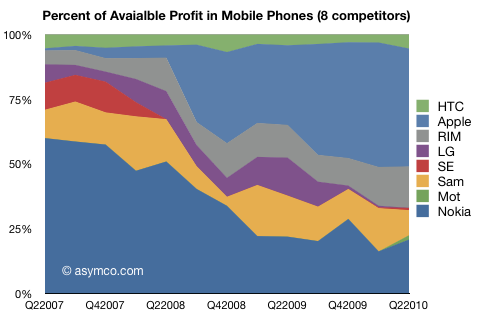 Note that profit share has mostly shifted from Nokia to Apple, though Sony Ericsson and LG were also casualties and Motorola has not had anything to lose. Some assume that the future belongs to the Koreans but we see that the relatively small amount of profit that Samsung has (less than RIM actually) has not changed much. HTC is also shown to be a steady performer but not having displaced much from competitors. Will Android change this picture? 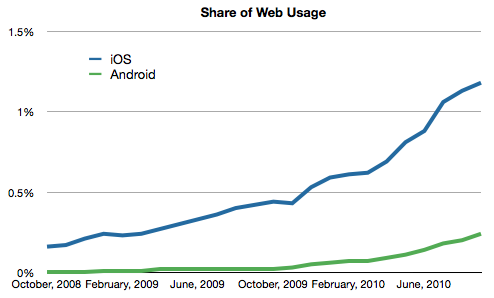 As I’ve argued before, Android is most attractive to the unprofitable and the strategically constrained. Can having undifferentiated new products change this? As Nokia is unlikely to license Android, and RIM seems very unlikely and Apple is out of the picture, the only possible contenders are Samsung, LG, HTC, Motorola and Sony Ericsson. Motorola and Sony Ericsson have both returned to profitability but with a very small volume Android strategy. However the incumbents fielding Android are really facing a far more sinister threat: the smaller local brands in China (e.g. ZTE) and emerging markets. On profitability, the smaller challengers are unlikely to make a large impact, but they will constrain the profits of other licensees. The distribution of phones on a global scale is challenging without a brand, and brands are very expensive to build. It’s still possible over a longer timer frame that a small brand like HTC can emerge on a global stage. But in terms of profit capture, challengers will mostly “steal” from the already constrained big brands running with Android. Profit is not the only measure of success and can sometimes be a deceptive indicator. For this reason I look at a longer time frame so that anomalies, seasonality and business cycles are smoothed over. As flawed as it is as a measure, the most important reason to pay attention to profit is that it’s the only fuel for growth in the long term. Companies that are consistently unprofitable (e.g. Motorola) face diminishing degrees of strategic freedom further lubricating a downward slope toward financial distress. @tim Google often finds out about new Android phones the same day the rest of the world does. The joys of an open platform! via (1) Twitter / Home. Clears up why they rely on “activations” to find out what’s going on in the market. Verizon, unfortunately, is also what ruins the phone. Or, rather, what it’s forced Samsung to do to the phone, which you could sum up in a word: Bing. Bing is the default—and only—search engine on the Fascinate. A Google Android phone. In the search widget, in the browser, when you press the search button. Bing. No, you can’t change it. There’s no setting for it, and the Google Search widget that you can snag from the Market is blocked (or at least very carefully hidden). Being unwittingly forced into Verizon and Bing’s conjugal relationship is infuriating on its own, but the implementation also feels like the sloppy hack that it is. via Daring Fireball Linked List: Matt Buchanan on Verizon’s Samsung Fascinate Lightning. The primary defense of Google’s Android strategy is that it’s beneficial in driving traffic to Google’s services/properties. This is by no means a certainty. To the contrary, it seems likely that the Android experience will be defined by operator back-room deals. Coupling a lack of control over the platform, the revenue streams, the user experience, the potential banishment of AdMob from iOS and an attack on Google’s brand, Android is currently winning the war with Google. However, my money long term remains with Google. They can and will eventually beat Android. Perhaps with Chrome. I went to the link below to look at some of the apps. I clicked Top Free tab and scanned through the featured apps. As Google puts it: “This is a showcase for some of the featured and top ranked applications and games available on Android Market”. It’s Android so it’s open (to copyright violations). I should note that if these free apps are monetized through Google’s ad network there seems, to my untrained eye, a clear legal liability.